Marvel Studios is sitting this year's San Diego Comic-Con out, but that doesn't mean that they've given up on the fun. Lucky attendees to the annual convention can pick up a free poster that revisits some of the most epic Comic-Con moments in Marvel Cinematic Universe history. The MCU has been making appearances in San Diego for the last 10 years and has announced 20 films in that time. Within those 10 years, the MCU has broken box office records and gone on to become the 7th highest grossing franchise in history. That is a very short amount of time, especially considering that Mickey Mouse and Friends, who is number 8, have been around since 1928. 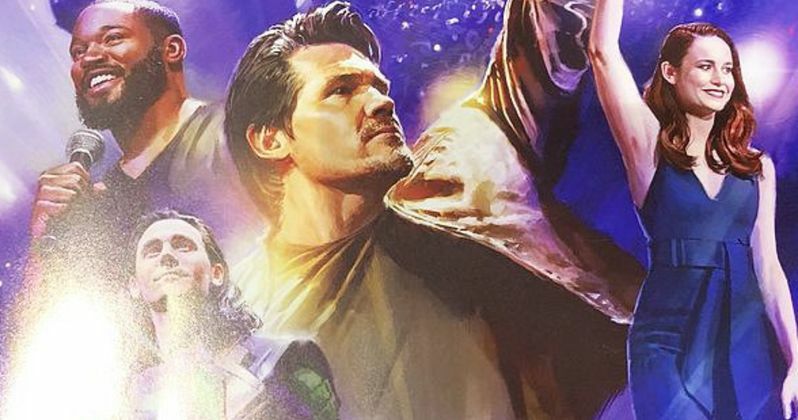 The new Marvel Studios San Diego Comic-Con poster features the cast of the original Avengers below, along with Marvel Studios boss Kevin Feige and Joss Whedon on stage. Above them are images of Tom Hiddleston as Loki, welcoming the crowd, Robert Downey Jr. after he walked through the crowd at Hall H to get up on stage, Josh Brolin wielding the Infinity Gauntlet, and Brie Larson as she was announced as Captain Marvel. While there are plenty of other moments that could have been used, the poster does a good job of picking some of the most memorable. Marvel Studios has a way of strutting into San Diego Comic-Con and stealing the show almost every time. Last year was the one-two punch of showing off the first footage from Infinity War and then sharing some concept art from Captain Marvel, while revealing details about the film including that a young, two-eyed version of Nick Fury was going to appear. The electricity in Hall H is pretty crazy every time, so it's a bit of a bummer that they won't be bringing down the house this year. However, that gives DC Films and Warner Bros. all of the time that they need to dominate Comic-Con 2018. With the first footage of Aquaman and Shazam! to be released, it looks like it's easily the year of DC. Plus, Gal Gadot is expected to bring the very first footage of Wonder Woman 1984 with her, which could very well end up being the biggest story of the weekend. Marvel Studios will be back next year with a proper introduction to Phase 4 of the MCU, after the dust settles from Captain Marvel, Avengers 4, and Spider-Man: Far From Home. The new Marvel Studios 10th anniversary San Diego Comic-Con posters are available for free at the convention, so if you're not able to go, see if a friend will grab you one, because they will more than likely end up fetching some major cash on eBay. This is usually the standard with cool free stuff at Comic-Con, especially having to do with Marvel Studios. You can take a look at the awesome 10th anniversary poster of the MCU's visits to Comic-Con below, provided by Marvel.